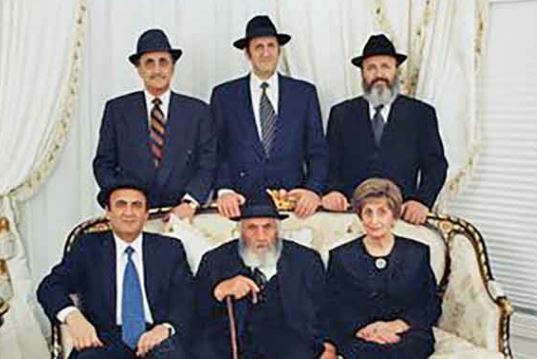 Moshe Morris Abraham Cohen (1887-1970) was born in Poland to a poor Orthodox Jewish family. While he was still an infant, his family fled the pogroms and settled in London, England. Growing up, Cohen often got in trouble so his parents sent him to work on a farm in Saskatchewan, Canada, hoping to mend his ways. There, he learned the value of hard work, in addition to playing cards and shooting guns. He became good friends with Chinese railroad workers, and even defended a Chinese man who was being robbed – a big deal at a time when white people rarely stood up for the Chinese in those days. Cohen’s friends invited him to join the revolutionary party of Dr. Sun Yat-sen, who would become modern China’s founding father and first president. Cohen agreed to train Chinese-Canadians in military combat and helped secure weapons for China’s revolutionary army. Meanwhile, he settled in Edmonton and became a successful real estate broker. 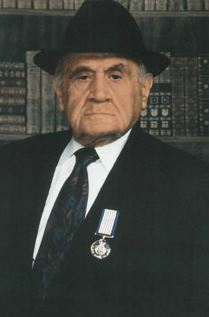 Cohen was soon appointed as the province of Alberta’s Commissioner of Oaths. With the outbreak of World War I, he fought valiantly with the Canadian Railway Troops. Finding it hard to make a living in Canada after the war, he moved to China. 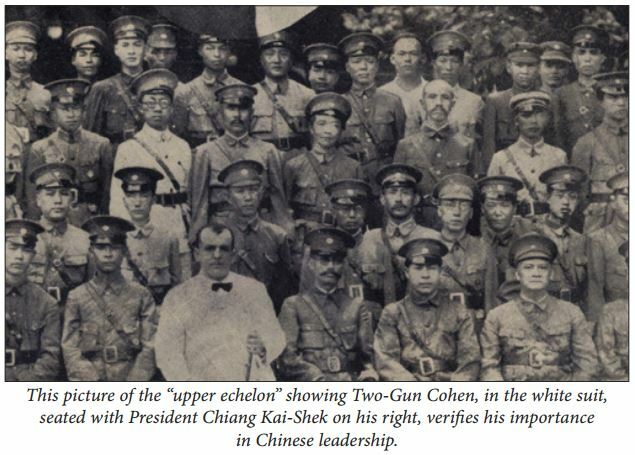 Cohen was hired by Sun Yat-sen to train his forces, procure arms, and serve as his personal bodyguard. After once taking a bullet while protecting Sun Yat-sen in an assassination attempt, he started carrying two guns, and henceforth was known as “Two-Gun Cohen”, though the Chinese called him Ma Kun, “Clenched Fist”. Following Sun Yat-sen’s death, Cohen continued working for China as a military commander and head of their secret service. During World War II, it was Cohen that proved the Japanese were using poison gas against Chinese civilians. Cohen was captured in battle by Japanese soldiers. He was nearly beaten to death before being freed in a prisoner exchange. Cohen then returned to Canada, settled in Montreal, and finally married. He spent the rest of his life in relative quiet, working as a consultant in various capacities, and often traveling to China. (He had the distinction of being the only person allowed to travel freely between China and Taiwan – as he was friendly with leaders of both nations, despite their antagonism towards each other.) Perhaps his last great act was convincing the Taiwanese not to oppose the UN Partition Plan that gave birth to the State of Israel. Taiwan’s position on the UN Security Council made their vote critical, and they intended to oppose the plan until Cohen stepped in. He also helped to arm the nascent State of Israel in its War of Independence. Cohen’s life inspired two books, as well as the 1936 film The General Died at Dawn, and the 1984 film The Gunrunner, starring Kevin Costner. 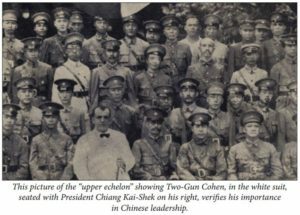 As a major general in China’s revolutionary army (to this day, the only Westerner to hold such a high rank in the Chinese military), one-time head of China’s secret service, and Sun Yat-sen’s personal aide, Cohen played an instrumental role in the founding of modern China. He was once described as China’s “uncrowned Jewish king”. Yom Kippur Begins Tonight! Gmar Chatima Tova! All lovers of democracy cannot help but support… the movement to restore your wonderful and historic nation which has contributed so much to the civilization of the world and which rightly deserves an honourable place in the family of nations. This entry was posted in Law, Politics & Military and tagged Alberta, Canada, Canadian Jews, China, Chinese Jews, Edmonton, English Jews, London, Montreal, People's Republic of China, Polish Jews, Republic of China, Saskatchewan, Sun Yat-sen, Taiwan, UN Partition Plan, War of Independence, World War I, World War II on October 11, 2016 by Jew of the Week.